Fellow workers Maguire and Goodman holding the Australia New Zealand General Organising Committee (ANZGOC) I.W.W. banner. The Industrial Workers of the World recruited new members in Australia during the resurgence of anarchism in 1975-76. This article tells the story of the Sydney IWW meeting in 1982 that erupted in physical violence which lead to the demise of the IWW in Sydney for several years. Central to the story are issues of accountability and organisational process, especially in regards to the paper, Rebel Worker, which started out as the paper of the Australian IWW. The arguments and passions engendered by the split in the Jura Books Collective during 1982, certainly is a factor to explain the events at the meeting, but subsequent problems with accountability of Rebel Worker shows that the problems were real and have never been resolved. Subsequent syndicalist organisation is briefly detailed, including the conflict at the 1992 Congress of the Anarcho-Syndicalist Federation (in part over the status of Rebel Worker)., and the revival of the Anarcho-Syndicalist Federation in the late 1990s, and the IWW in the 1990's. By 1975 Bill Graham in Launceston Tasmania was the only active member in Australia. 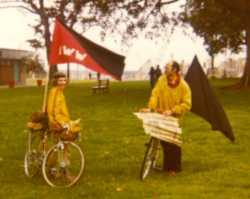 I joined the IWW in April 1975 and started actively trying to recruit members from the anarchist scene. (6) Leigh Kendall, in Canberra, also joined during 1975. I remember one of the discussion evenings at the anarchist bookshop at 149 Lawson Street was addressed by IWW member Pat Mackie, who played a pivotal role in the Mount Isa Dispute of 1964/5. 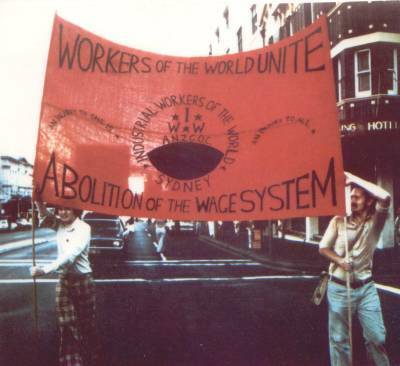 In 1976 there were three wobblies in Sydney and the Australia and New Zealand General Organising Committee (ANZGOC) was proposed to continue building the IWW. A vote taken of members setup the committee. An IWW General Defence Committee Local No 5 was formed in Sydney in January 1976. From March 1976 for a year I acted as a delegate collecting dues, signing up members and importing Wobbly literature. The Sydney Anarcho-Syndicalists was formed as the Sydney group of the Libertarian Socialist Federation, which derived from a split in the Federation of Australian Anarchists Conference held in Melbourne in June 1976. IWW members were involved in this organisation from the start. Jura Books, a development of the Jura Literature Service in Sydney, was initially the bookshop for the Sydney Anarcho-Syndicalists. In May 1979 the last meeting of Sydney Anarcho Sydnicalists was held. It decided to hand over control of the building to the Jura Books Collective with provisos that there were defined procedures for joining and expulsion, and provision for a Library and an IWW office. In early 1981 the ANZGOC was reorganised as the Australian General Organising Committee, and used a small office at Jura Books. From my recollection the IWW membership in Sydney was composed almost entirely from people who were members or former members of the Jura Books Collective. Ten days later I sent a letter to the Secretary of the Sydney Group IWW describing the events at the meeting and requesting apologies from Couch and Maguire for their acts of violence and intimidation: no response was ever received. These acts of violence effectively ended the meeting and the Sydney Group of the IWW. After seven years membership of the organisation in Sydney I allowed my membership of the IWW to lapse after October, as I could no longer work with most of the current members. 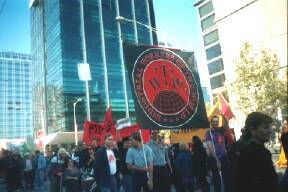 I had been instrumental in restarting the IWW in Sydney in 1975 and 1976. In a matter of months the remaining members would discontinue their syndicalist activity under the IWW banner. Rebel Worker was published as "paper of the Australian IWW" from the first issue in February 1982 under the auspices of the Australian General Organising Committee. The April-May 1983 edition changed the masthead to "anarcho-syndicalist paper", and contained an editorial collective comment explaining the change from being a paper of the IWW to an anarcho-syndicalist propaganda group. In essence, the Rebel Worker group did not want to be accountable to a wider organisation, and they effectively closed down the local group of the IWW to achieve this. In 1986 over the January long weekend a conference of anarcho-syndicalists was held in Sydney, with people primarily from Sydney and Melbourne groups, at which the Anarcho-Syndicalist Federation was formed. The Melbourne local of the Anarcho Syndicalist Federation (ASF) published the first issue of Sparks in May 1986. In February 1987, the Public Transport Workers Association was admitted to the ASF and continued to publish 'Sparks' which became the most popular publication in Melbourne's public transport industry with a circulation of over 5,000. A core group of four to seven people published and distributed Sparks, with many more contributing news and donations to cover its free distribution. Maguire is correct in saying the status of Rebel Worker was under threat, but there was also a high degree of paranoia about the organisational direction. From my conversations with ASF members in Melbourne it seems the reasons for existence of the Melbourne Central and Melbourne North locals was due to the inability of members to work together. This was resolved in Melbourne by an agreement to split the group based on affinity, and approximating the geographic location of members. The intention, I believe, was to resolve severe personality conflicts, not to stack a congress, but this is difficult to prove unless you know the individuals involved. There was widespread dissatisfaction with the accountability of Rebel Worker, and Melbourne delegates at this congress wanted Rebel Worker to either become more accountable to the Federation, or to change to being the voice of the Sydney Local only. After the Special Congress for several months there were two groups of people claiming to be the true Anarcho-Syndicalist Federation. This was only resolved after a Spanish delegate from the IWA/AIT visited Australia and talked to all parties and reported on the conflicts. Rebel Worker became an autonomous collective, and then a paper of the Anarcho-Syndicalist Network (based in Sydney). From 1995 Richard Curlewis and Jeremy Dixon were the Melbourne contacts for the post-split Anarcho-Syndicalist Network. The Melbourne anarcho-syndicalists reformed into the Anarcho-Syndicalist Group-Melbourne (ASG-M) "in January 1997 after a blossoming of interest in anarcho-syndicalism amongst Melbourne anarchists and workers." (18). Meanwhile, membership of the IWW again grew in the 1990's. By the end of the decade the IWW could boast of General Membership Branches in Melbourne and Brisbane plus members in all states of Australia. Some success in organising amoung marginalised workers has occurred. A quarterly journal, Direct Action, was being published, which now appears twice yearly?! in a broadsheet format. A lot of effort from IWW members has gone into the East Timor Commmunity Computer Project (www.etccp.org.au/). In February 2002 Rebel Worker celebrated twenty years of publication. Rebel Worker continues to be published as the paper of the Anarcho-Syndicalist Network. It has remained the tool and voice of Mark McGuire and people he agrees with, from its inception to the present. Attempts to make it accountable to larger organisations it purportedly speaks for have been consistently sabotaged, from the Industrial Workers of the World (IWW) to the Anarcho-Syndicalist Federation (ASF). While the commitment of Mark McGuire to publishing Rebel Worker on a regular basis since 1982 cannot be doubted, it is important that if it speaks for an organisation that it also be held accountable to the organisation. While Rebel Worker does provide a valuable outlet for discussion and reporting of industrial issues from an anarcho-syndicalist viewpoint, the turgid and ideologically combative style of much of Maguire's own writing turns many people away. 2. I. Turner; Sydney�s Burning! an Australian political conspiracy (Alpha Books, Australia, 1969). 5. Ho for the Merry Month of May (1968) - Melbourne Anarchist Archives. 7. Anarcho-Syndicalist Committee Communication #1, Sydney May 1981. 9. The General Organisational Bulletin of the Australian IWW - 4, May 1982. Greg Platt's Resignation Letter as Secretary of the Sydney Group IWW, dated 13 March 1982. 10. The General Organisational Bulletin of the Australian IWW - 4, May 1982. Report of the General Secretary of the General Organising Committee, Sid Parissi. 11. Personal notes of this meeting, and letter demanding an apology by John Englart. © John Englart. All Rights reserved except for nonprofit, union or educational use, please credit source.